When our TV died, I had a problem... and I don't mean just that our TV died and I need to spend money on another. No, I had another problem. You see, our previous TV had this power save feature where, if enabled, it would put itself into sleep mode after a minute of no incoming video signal, and it would wake itself as soon as it started receiving a video signal. This lovely feature got us into the convenient habit of only needing to turning on and off the A/V receiver, and never the TV. So when I went to pick up a new TV, I found that none of them had this feature! I was surprised, as I figured it would have been pretty a standard option on sets nowadays seeing as how everyone is trying to save power anyway they can. But nope, so I had to search for an alternate solution. At first I figured I could plug the TV straight into my A/V receiver, as many receivers have AC outlets built in. Unfortunately, mine does not. And I checked out the specs on some other receivers online, and none seem to have the power requirements for the TV we got. So with that option gone, I continued my search... and came up with nothing. Then, as I was doing some searching completely unrelated to this topic, I stumbled upon the Smart Strip Power Strip from BITS Limited. The Smart Strip Power Strip will automatically turn on and off power to it's outlets based on the power draw from one specific control outlet. So basically, plug the A/V receiver into the control outlet, and the TV into one of the other outlets. Then, when the receiver goes off, the strip will cut power to outlet housing the TV, and when the receiver goes on, the TV's outlet gets it power back. Sounded like a perfectly plausible solution to my dilemma... so long as our TV would remember that it is in the "on" state when it gets power back. A quick test confirmed that it did, so I went ahead and ordered one of these. I ordered the 7-outlet SCG4r model. I was out of town when it arrived (that was when I was helping my uncle get his house ready to sell). But as soon as I got back home, I hooked it up and tried it out. I cut the A/V reciver on, and after hearing a little click come from the Smart Strip, the TV turned on! Then I cut the receiver off, and after another little audible click from the Smart Strip, the TV cut off. Great! I worked! Or, at least it did the first couple times. Then it started doing this weird thing where, when I turned the receiver on, the Smart Strip would quickly turn on, then off, then on. Luckily, the designers were intelligent enough to build in an adjustment knob for tuning how much power should be detected before it will turn on and off. So I turned it down, and it once again worked great! Or, at least for the first couple times... again. Then it started to not turn the outlets back on. So I adjusted it again, back the other direction slightly, and now it seems to be in a pretty good spot. It has been months now, and it worked consistently, 100%. Occasionally we will still get an on/off/on sequence, but it rarely happens and still ends up in the right mode after all, so it's not really a problem. 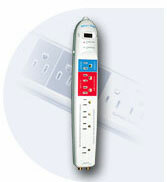 The 7-outlet Smart Strip that we have contains one control outlet, two always-on outlets, and 4 auto-switched outlets. What would be really useful is a switch for each outlet that would allow you to select which ones you wanted to be always-on and which you want to be switched, because I only use two of the switched outlets (one for TV and one for the sub-woofer) and have to use a separate power strip to provide me with additional always-on outlets. It would be really nice to see this in a future version of the Smart Strip. But as it stands now, this is definitely a well-built and extremely useful product. There is also a 10-outlet version, with 6 auto-switched outlets for those of you with tons of equipment that needs to be turned off, though I think most people would do good with the 7-outlet version. For a home entertainment center, you'd probably do a TV, a DVD player, and a sub-woofer, which would still give you one auto-switched outlet not used. And for a computer setup, you probably have a monitor, printer, speakers, and external modem or external hard drive that you'd want to turn off. It's now been almost a year since this review, so I figured it was time for an update. We have had several more instances of flaky power-off detection. There have been many instances when we'd turn the A/V receiver off and the power strip just went into a frenzy of turning the outlets off and on. We have tried adjusting the dial on many occasions, but it seems to be only a temporary solution, as it will always resume its seemingly erratic behavior.